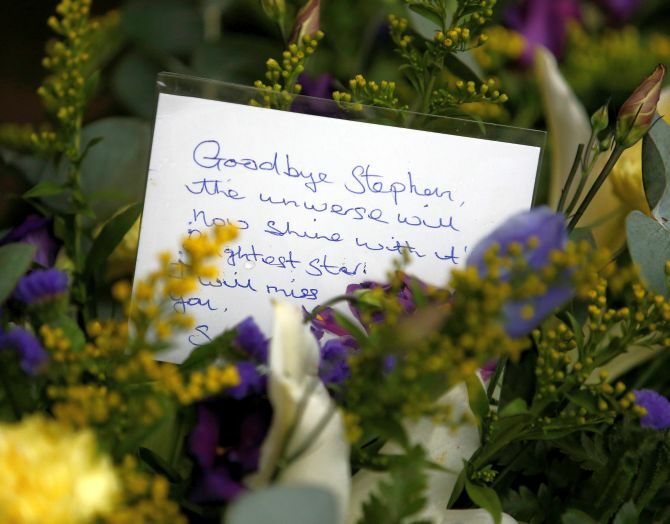 The funeral of legendary British theoretical physicist Stephen Hawking was held on Saturday in a private ceremony attended by around 500 people comprising family, friends and colleagues, at a church near the Cambridge University college that was his academic home for more than 50 years. One of the world’s best known scientists and author of ‘A Brief History of Time’ died peacefully at his Cambridge home on March 14 at the age of 76. 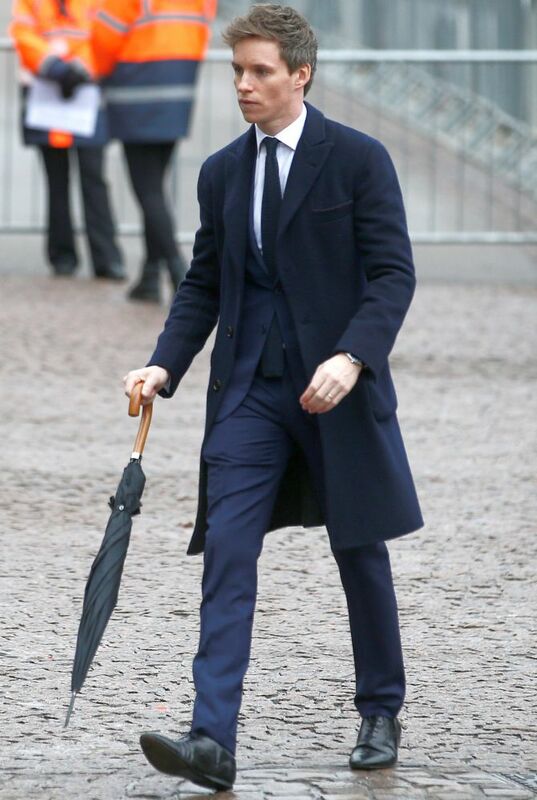 British actor Eddie Redmayne, who won an Oscar for his portrayal of the world-famous theoretical physicist, was among the main speakers at the ceremony. 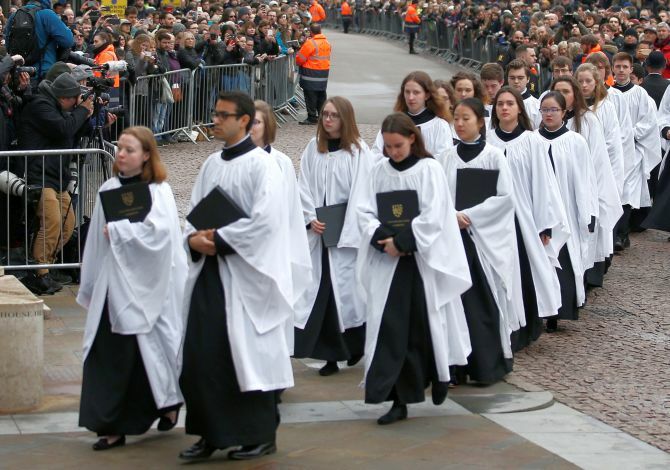 The private funeral service at the University Church of St Mary the Great near Gonville and Caius College at Cambridge University was chosen by Professor Hawking’s children. 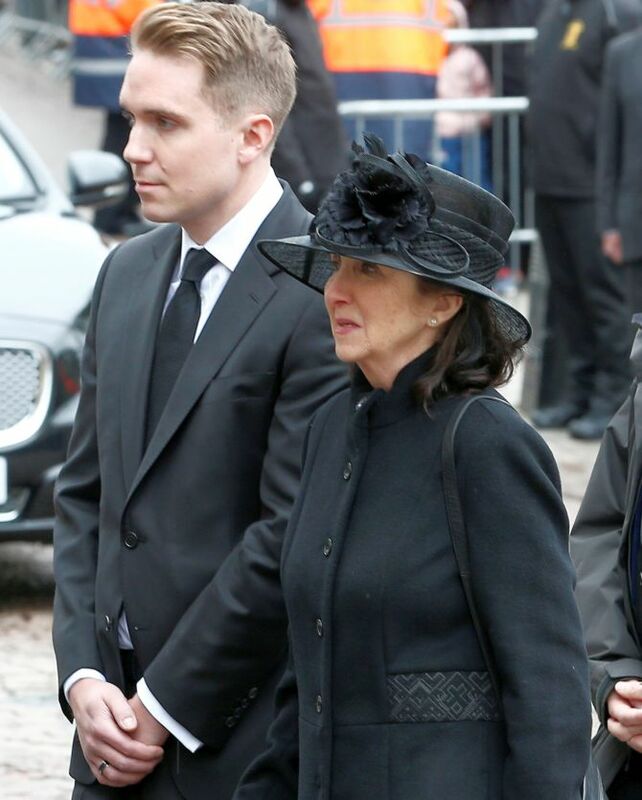 Lucy, Robert and Tim Hawking said they chose to hold the funeral in Cambridge in recognition that it is the city their father “loved so much and which loved him”. “Our father’s life and work meant many things to many people, both religious and non-religious. So, the service will be both inclusive and traditional, reflecting the breadth and diversity of his life,” they said in a statement. 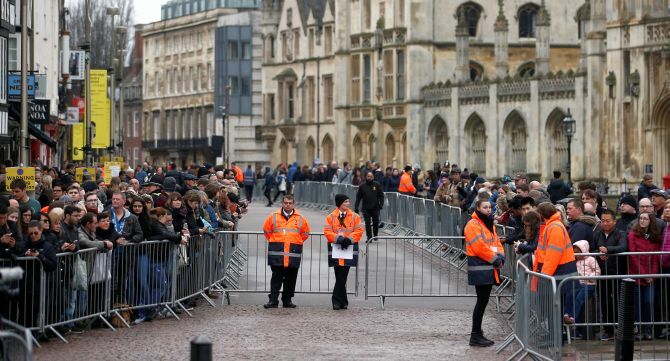 IMAGE: Actor Eddie Redmayne was among the first to have arrived in Cambridge for the funeral. Redmayne played the theorectical physicist in the Oscar winning movie "Theory of Everything." Hundreds of people who had gathered outside the church clapped, when the hearse carrying Professor Hawking’s coffin arrived. As the funeral cortege reached the church, the bells rang out 76 times, once for each year of the physicist’s life. White lilies representing the universe and white roses representing the polar star were placed on top of his coffin, carried into the church by six porters, all in traditional uniform, from Gonville and Caius College where Professor Hawking was a Fellow for more than 50 years. The service was officiated by Reverend Dr Cally Hammond, Dean of Gonville and Caius College, which was his professional base for most of his life. 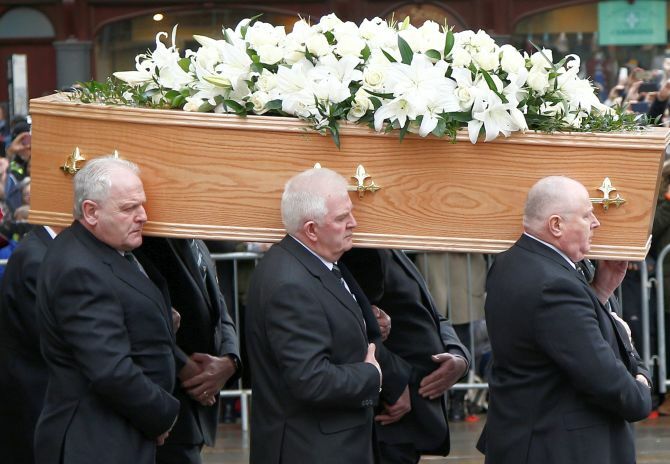 The funeral will be followed by a private reception at Trinity College, Cambridge University. A book of condolence for the famous Fellow of Gonville and Caius College remains open at the premises as well as online. Ahead of the funeral, the college released new black and white photographs of Hawking taken in 1961 at a summer school for young astrophysicists at a castle in Sussex, southern England, when he was 19. 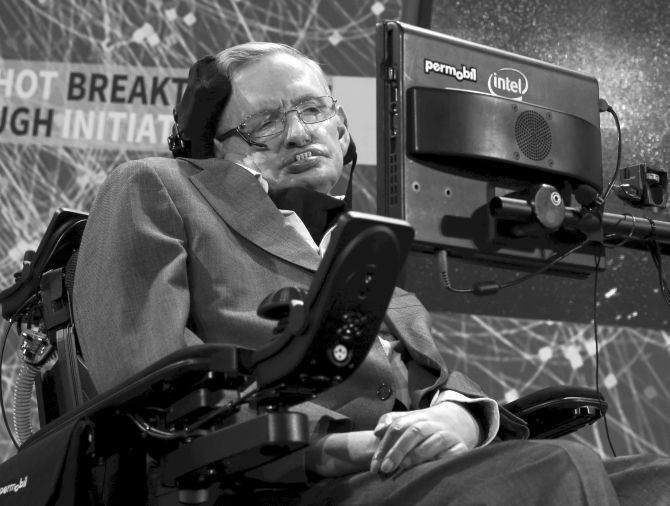 It was announced earlier this month that Hawking’s ashes will be buried near the grave of Newton, another famous British scientist, during a thanksgiving service on June 15. “It is entirely fitting that the remains of Professor Stephen Hawking are to be buried in the Abbey, near those of distinguished fellow scientists. Sir Isaac Newton was buried in the Abbey in 1727. Charles Darwin was buried beside Isaac Newton in 1882,” said the dean of Westminster, the Very Rev John Hall. ALS kills in 3 years. How did Stephen Hawking survive it for 57 years?